Animals such as lions, tigers and cats naturally have really sharp claws. While the former two depend on the power and sharpness of those claws to hunt in the wilderness, it is not the case with domestic cats. Pet cats usually live most of their lives in human custody, so they really don’t need to worry about hunting much. Thus, eliminating the need for sharp claws. Subsequently, overgrown cat claws can prove to be quite the nuisance in households as they will unintentionally ruin your carpet and furniture. Not only do these claws cause monetary harm, they even injure themselves and can hurt you and your kids too. Hence it is wisest to clip them on a regular basis. Here’s all you need to know about cat nail clippers! If you are into the techy nail clippers, then you will definitely love this one. The Nail Grinder is the perfect choice for an easy to use, painless trimming and stress-free grooming experience. It is small, and lightweight, making it super easy to use and pet-friendly. And guess what, it comes with a USB charger which means you can charge it anywhere you want. Very easy to use, and portable. It comes with a USB charger for charging conveniences. The days for your pets to stress out and make a fuss about grooming day are long gone. The Safari 770045 Professional Nail Trimmer by Safari Pet Products is making it easy to do it at home, pain and hassle-free. The stainless steel cutting edge is sharp and long lasting, gets the job done without any issue. There is a Safety Stop feature with locking blades that help prevent any injuries. The trimmer is relatively light, small, and easy to grip thanks to its handles covered with vinyl. Though little, this trimmer is quite mighty. The Profession Cat Dog Pet Nail Grooming Trimmer Clipper is durable and made to have a profession trim at home easily and quickly. The safety guard and locking mechanism ensure safety during and after the grooming process. Due to the built-in spring mechanism, controlling the pressure exerted is easy and guarantees a smooth trim every time. Pet Republique’s Professional Dog Nail Clippers are the perfect product to groom the tiniest breeds of pets residing in your home. Whether it be a small kitten, puppy, a rabbit, or even a Guinea pig, all your problems are solved with just this one amazing product. Plus, why not buy a pet grooming product for a good cause. 15% of Pet Republique’s profits go to the American Animal Rescue Shelter, where abandoned cats and dogs are given a home to. This is an amazing cause that the company is contributing to. TIP: To make the nails a bit more visible, apply baby oil before cutting. Also, if your pet’s nails are relatively quiet long, you should trim off a bit of the access and then wait a week before trimming some more. Epica’s Professional Pet Nail Clipper does wonders to your daily grooming routine, and give an amazing grooming experience that both you and your pet will love. There are no more guessing where you are cutting thanks to their innovative semicircular blade design that is meant to rest your pet’s claws so you can perfectly see where the cuts are being made. These stainless steel blades are resistant to scratches, rust, will not bend and stay sharp throughout the usage period. If there is one thing that all pet owners must invest in, it is UEETEK’s Pet Nail Grinder. It is light and compact, with an easy to hold design. It comes with a rechargeable battery that lasts for days and emits a low enough noise that does not scary your pets. Do you have little kids running around who tend to play with anything and everything, and might actually get hurt if they get their hands on a pet clipper? Then you should definitely get Gonicc’s nail clipper which comes with a locking system! It also has a built-in, hidden nail file which will allow you to smoothen out your cat’s nails in one go. And it definitely has some great customer reviews! 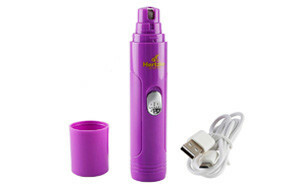 Well-designed, ergonomic clipper that has non-slip handles and is strong, comfortable and light. Blades are extremely sharp and made of top-notch stainless steel. Do all clippers come with manuals? No, because not everyone is as concerned about your pet the way Shiny Pets are. They make eco-friendly clippers from recycled plastic, so they are quite concerned about the environment as well. Perfect for small animals, these clippers have been reviewed to work equally well for large cats as well. Customers really love the safety stop too as it helps them keep them kitties unharmed. If you are someone who researches a hell lot before buying anything and depends a lot on reviews, then you will DEFINITELY love this clipper. It’s a scissor clipper which probably has some of the best reviews in the market, due to its sharp blade, sturdiness and aesthetics too! Moreover, 15% of H&H Pets’ profit goes to Hope for Paws, which is a non-profit organization dedicated to animal rescue. Perfect for small pets such as kittens or puppies. Recommended by MANY veterinarians and grooming experts, these are definitely one of the best clippers in the market. It has a slightly angled blade which helps in clipping as cats have slightly angled claws too, unlike humans. They are durable and strong; basically everything you would want from a cat nail clipper. Obviously, there are many types of clippers in the market, and each type has several different models. While the basic purpose of each might be the same, you should look into certain factors before deciding to buy one as your choice will decide both you and your kitty’s comfort. At the end of the day, the most important part of a nail clipper is its blade. No matter how many features it has, it will not be of any use unless it has a good, sharp blade. When buying, make sure the blade is sharp and rust-free at that point in time. We recommend using high-quality stainless steel blades which will not rust or go dull very easily. Always remember that a sharp blade will make clipping swift, clean and painless while a dull one might potentially injure your cat while you keep trying to clip its nail or even cause crushed nails. We also suggest that you get a nail clipper which you can easily sharpen yourself too so that you can always use a freshly sharpened blade for clipping your cat’s nails. Just like any other product, nail clippers come in both basic, fancy and sophisticated forms. While the fancier ones might be more aesthetically pleasing, you should first consider whether you can use it properly. Look for features such as rubber grips or anti-slip grips, which will help you grip the clipper easily, therefore you can clip comfortably. You should also prefer handles that are long compared to your own palm size, that way you can get better leverage while gripping it. While cat grooming might seem like a relatively easy task if you have a very well behaved cat, many things do go wrong while cutting cat nails. One of the commonest problems that occur is over trimming, which occurs when someone cuts too near the quick and bleeding occurs (obviously, you would not like to cut off so much of your nail that bleeding occurs, similarly cats also feel a lot of pain when someone cuts to their quicks which basically has all the nerve endings and blood vessels). Hence, there are certain cat claw clippers that come with safety features such as a “quick guard” which prevent you from going too near to the base of the nail. Many people do not prefer using such clippers as they think it does not let them trim the nails properly, but we suggest you use clippers that have this feature. Or any other safety feature-for that matter- as we believe you should never take risks when it comes to your beloved pet. There are manual clippers, then there are the electronic ones. Many people are apprehensive when it comes to using an electronic machine to cut their cat’s claws, hence think about which one you would prefer. The importance of cat nail trimming is GIGANTIC and often ignored. We have seen many cat owners try to trim their cat’s claws once or twice, find out their cat is uncooperative, and then give up on a whole. Many even think that since their cats are always scratching things around the house, they are sharpening their claws by themselves hence trimming them down too. However, this belief is wrong as scratching is a cat’s instinctual habit, and it has more to do with marking their own territory (with the scent released from their paws while scratching) rather than trimming down their claws. Pet cats spend most of their time indoors (especially if you’re living in the city), which means they are often walking around on furniture or carpets. Furniture has many crevices or openings, in which their claws might get stuck while walking or while they are scratching it. Or, when they are walking on a carpet, their claws might get intertwined with the fabric or with loose threads. Either of these scenarios might lead to broken claws. Even if they are not walking on furniture or carpet, long claws will get in the way of anything they do. The way humans hurt themselves while having long nails by unknowingly scratching themselves, or the way they face inconvenience while trying to work with long nails, same happens with cats too. They scratch themselves out of instinct or because of fleas and end up hurting themselves in the process. They can even break their claws trying to jump to your lap or some other surface, or while playing with you. Broken claws can be really harmful to your cat as it causes profuse bleeding and even infections too. If you fail to notice the symptoms, an infection can turn fatal in a very short time, and many cats have died this way. Other than broken claws, there are different health hazards too. Dirt, debris and germs can get stored under those long claws which might later be ingested by them, causing digestion issues. Also, that dirt or germs can harm your family members when your cat is playing with you guys. The above-mentioned problems are things that occur in a short period of time, but there can be long-term problems too. For example, long nails can alter how your cat walks as walking with big claws can be a hassle. This can ultimately lead to ligament problems or arthritis as extra pressure is put on the bones and ligaments. Finally, let’s move on to the kind-of selfish importance of claw clipping. When cats move about, their claws will DEFINITELY damage your furniture, no matter how careful you try to stay. Sharp claws can tear your curtains, bedsheets and clothes too. They can mark or scratch expensive furniture or showpieces, amongst many other things. And let’s not forget the screeching sound they make when scratching something made of metal! Standing up to their name, Guillotine Clippers have a structure similar to guillotines, in the sense that they have a small stationary ring in which you have to put your cat’s nail. It looks and feels similar to a hole puncher, and when you squeeze the handles, a blade slides forward to slice off the nail beyond that point. This type of clipper is good for small to medium cats as it will not be able to trim a larger cat’s nails (it’s not strong enough). Moreover, using this clipper is risky as it will directly slice off as much as nail as you put in the hole, so if you place it too close to the quick, bleeding will occur. If you place the nail in a crooked way by mistake then the nail might get crushed too. To use it properly, you will have to replace the blade from time to time. The look like scissors, and are used like scissors too. In our opinion, these are the best type of clippers available in the market. 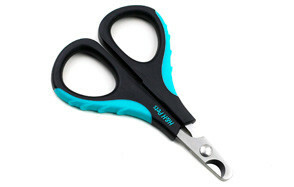 Since they are so similar to scissors, using them is very easy. You will have a CLEAR idea about how much you’re cutting, unlike guillotine ones in which you sometimes can’t judge how far in the nail is. They can also be easily used for larger cats; they can actually be used for any size of a cat. Scissor clippers are usually very strongly built and due to its mechanism, the adequate force needed to cut tough nails can be applied. Moreover, you barely need to replace the blades. Just sharpening them once in a while is more than enough. Even with scissor clippers, you run the risk of clipping off too much or clipping too close to the quick if you are not careful. If you’re someone who always ends up going too close or is not confident with those type of clippers, then a grinding tool trimmer is the one you need. It is made up of sandpaper or emery board that will grind down cat’s nail bit by bit, that too quite easily. You’ll be seeing the gradual decrease in length so there is no risk of clipping too much suddenly, you can stop whenever you think you have reached an appropriate length. Another additional advantage is that you will be grinding the claws smoothly, so there is no need to file the nails after clipping, which is mandatory with other clippers. They can also be used for any cat, regardless of the size. A: Using cat nail clippers takes quite some preparation as you cannot do it just whenever you want to. Obviously, trimming or clipping claws manually is not something cats are used to naturally so they might make a fuss when you try to cut their nails, especially if you have never done it before. It is best to get your cat accustomed to clipping from an early age as that makes the process easier as time goes by. Look for the right mood. Your cat has to be in a good mood or at least in a relaxed one, otherwise, it will attempt to bite your head off. Suitable times are when it’s preparing for a nap, or just waking up from one, or when it’s content after eating food. Unsuitable times are when it’s hungry or running around actively. Make sure you have your tools ready: sharp clippers and a styptic pencil. Slowly and gently, make your cat relaxed and put it on your lap in a sitting position, with its back towards you. Take the clippers in one hand a paw in the other (start with the left paw so that your clipper is in your right hand if you’re right-handed). Find the quick. Mentally mark a level that is at least a few millimetres (at least 3-4) away from it, which will be the maximum distance you can trim. Clip the claws. Place your clipper halfway between the nail and quick, and carefully try to clip it in one go. In the beginning, you might have to clip one or two nails at a time and then let your cat go, but slowly it will become accustomed to it. Do not rush, do not yell at it. If your cat protests then let it go and try again another time but don’t force anything on to it as it might scratch or even try to bite. When you’re done, give it a treat. Cats love rewards and will make them eager for the next trimming session! A: This depends on your expertise. If you are a beginner, then we suggest you use a grinding tool trimmer or a scissor clipper, at best. If you are an expert who is confident about trimming your cat’s nails then you can use the guillotine one. Whatever you use, make sure the blade is as sharp as possible and you file the nails after you clip them as otherwise, the sharp edges might ruin your furniture. Q: How often should my cat’s nails be trimmed? A: Once or twice a month, depending on how fast they grow. If you can hear a clicking sound when they walk, it means it’s time for a grooming session. Also, keep an eye out for broken claws or split nails. These require clipping sessions before the scheduled one. A: Cat nail clippers can last you for as long as years, so you don’t need to replace them very often. If you can find a way to sharpen the clippers than there is no need to replace them at all as that is what matters the most and needs to be replaced after some time. If you notice your clipper getting harder to clip with or hurting your cat/ crushing its nails then it’s better to change them as soon as possible. Q: Can I use my own nail cutter/scissors to cut my cat’s claws? A: Well, don’t use your “own” nail cutter as it is not hygienic at all. But you can definitely use human nail cutters (even though vets advice against it). Just be sure you are using a separate one for your kitty, and if possible use a toenail one which is usually bigger. Q: Can I use cat claw covers instead of clipping? A: Preferably not. When you use cat claw covers, you are preventing your cat from fully retracting or detracting their claws as the covers are glued on the nails. If they try to retract their nails, the covers might actually injure them and eventually cause infection. We do not recommend using cat claw covers UNLESS the only other option is declawing.